Raise your hand if you’re overwhelmed by all the marketing strategies you know you *should* be doing but can’t seem to find the time. 2018 was kind of exhausting, am I right? It seemed like every day there was another strategy to learn – or even worse, that moment when a strategy that had been working great for you all of a sudden stopped working. And then there were those days when a platform went down, an algorithm changed, and everyone was left scrambling. And then of course it always seems like there’s always one more webinar replay to watch before it expires, one more ebook to read, one more course to buy. And yet, you’re still left with this nagging feeling of being behind, of not doing enough. I don’t want that for you in 2019. 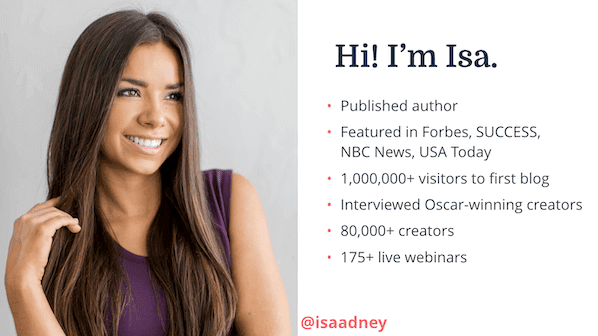 Hi, if we haven’t met yet, I’m Isa, the Webinar Producer at ConvertKit. The live workshop is happening Tuesday, January 8th at 11AM Pacific | 2:00PM Eastern. This special 90-minute strategy-packed workshop will feature real stories and strategies from creators earning a full time living online. My goal is that you walk away feeling empowered to take back the control of your marketing strategy, remind yourself why you got into all this in the first place, and help you focus on the strategies that are actually working right now (so you can ignore everything else!). This workshop is going to be useful for everyone, not just those who use ConvertKit – that means you’ll get real, actionable takeaways you can implement right after the workshop to rock your email marketing in 2019, no matter what email tool you use. This workshop is all about highlighting what will make the biggest difference for you and your business in 2019. Be sure to mark it in your calendar so you don’t forget to show up live – there will be free stuff only available live that will help you turn all that motivation into action!
] and be sure to mark your calendar to show up live Tuesday January 8th at 11AM Pacific. Spots are limited so do come early if you want to be sure to be there live and get some pretty cool free stuff that’s only available live!